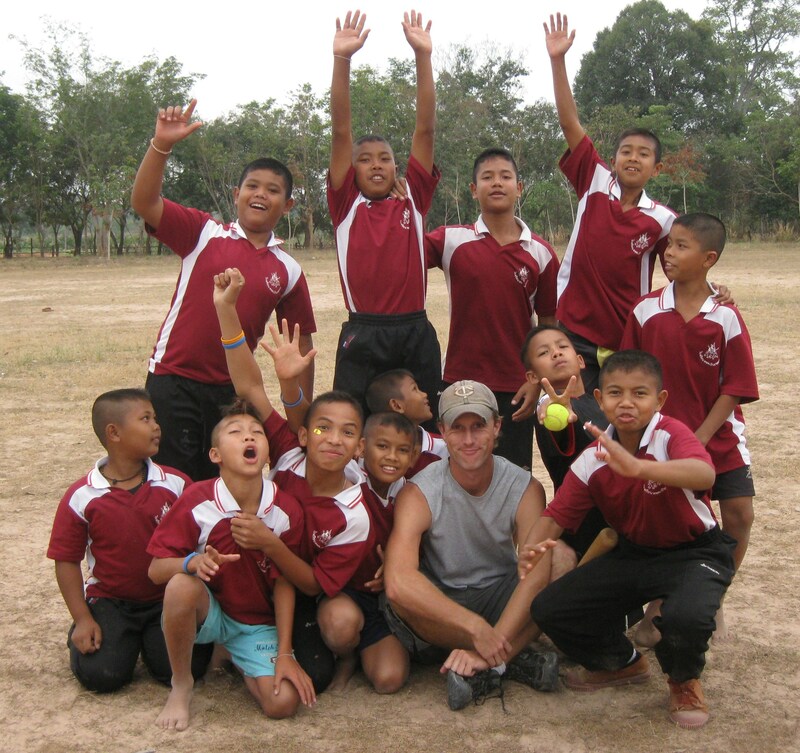 Every week for almost six months I’ve been teaching the boys in my village how to play baseball. They’re beginning to impress me. I teach mostly in Thai, but with some American vocabulary and it’s getting through. No one runs on a fly ball anymore until after it’s caught. The force out is slowly taking hold. Sometimes players are still tagging the base when they should be tagging the runner. The problem with the kids understanding the game more is it can weigh on my patience. Most of them now understand if they get four pitches that aren’t good, they get a walk and don’t have to hit. The kids who don’t hit well use this to their advantage and I sometimes I feel I’m back in the states watching a Red Sox / Yankees game. I tell them not to be shy and swing the bat since we usually only have one hour to play. One kid who cannot hold onto the bat after his swing to save his life. The ball rarely is hit, but the bat always rolls towards third base. Thais are very social and aren’t much for being alone. This might explain why I can never get anyone to stay secluded in the outfield. I can’t count the number of times someone hits a line drive to the outfield and I look back to see the left fielder walked in to talk to the shortstop. I’m just happy the kids don’t take my screams seriously and get offended. I do my best to do it with a smile. What are you doing? You’re supposed to be at first base! Stand up! Move back! Throw, throw, throw! At a village gathering next to my house, I found myself secluded with a few players from my team. I asked them if they wanted to watch baseball and they couldn’t have been more excited. I brought my computer outside and turned on a White Sox / Twins game from 2010. With every pitch, the kids were yelling out the count. Strike one! Ball three! Two out! Unfortunately I am no longer teaching baseball at the school I go to on Tuesdays. The main teacher left and I’m left with another who doesn’t seem to have interest in it. In my opinion, kids learning the excitement of the suicide squeeze is better for them than how to greet someone in America. I am fine. Thank you. And you? Many volunteers have agreed to be a successful volunteer in Thailand we simply need to continue to do what we love, be a good example for the United States of America and spread some smiles across the world. It’s a great job.